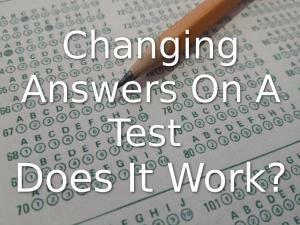 Changing Answers On A Test – Does It Work? 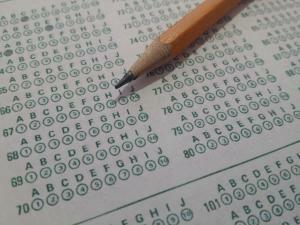 Is changing answers on your test a good idea? There is a ton of data on the subject and the answer is: YES! Do not just trust your first instinct on a test. If you answer a question but seconds later think you might know a better answer then you’re probably right. Changing your answer improves your score* but there is more to it that you’re going to want to know. You’re going to need to understand why this happens to fully appreciate its benefit. *For the curious: Some of these studies controlled for knowing that changing your answer improves your score. That means, your score will still improve when you’re only changing it because you know changing it is smart. Students don’t go overkill and start changing right answers to wrong ones when they learning changing answers helps their score. How does an answer change help? Instincts are not about finding the truth. They are about survival. Do you remember how it felt to be learning something new like driving a car? At first, it can be complicated. Move the gears. Check the mirrors. Hold the brakes and turn the wheel. There are hundreds of details that your brain needs to look out for. When you’re learning anything new your brain is working overtime. Now imagine how you feel doing that new thing you learned years later. It got easier, right? Stuff gets easier because the brain starts creating shortcuts for decision making. When I’m driving, I don’t see brake lights come on in front of me and think, “Man… what are those lights for again?” I just press the brakes. It happens. I don’t think about any of it. These heuristics make up most of your life. 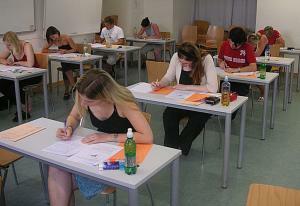 When you’re taking a test, heuristics are usually your first instincts. Changing your answer is letting the logical part of your brain take the wheel. You are going to end up right more often than you end up wrong. BUT MY EXPERIENCE SAYS OTHERWISE!?!? Yes… my experience says otherwise too. That’s because my experience is just another heuristic. It’s a good first guess but it’s just wrong. When you’re examining your completed tests, your brain probably has a shortcut of looking at your wrong answers (and skipping the ones you got right.) 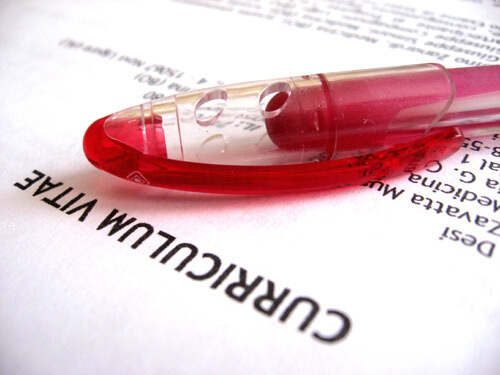 The bright red pen will direct you straight to your problem areas. That means you’re probably not getting a fair representation of your results. When you get an answer wrong because you changed your answer, you will probably notice it. It will stand out. The bright red circle just pulls your brain in. It forces your attention to it. Since it’s a question you probably spent a minute or two on, you’ll remember why you got it wrong. When you get an answer right because you changed your answer, the opposite happens. There are no red circles directing your attention to how awesomely smart thinking twice was. It will just slide by unnoticed while you let your eyes wander over other red marked areas you need to think about. Your brain focuses your attention on what is needed instead of what worked perfectly as planned. It’s just another shortcut making the appreciation of changing your answer hard to notice. It’s not a given that you should always change your answer though. The research has shown some answer changing actually hurts your chances of being right. Do not change your answer when you’ve already changed it once. This is where you start to see a reduction in your scores. 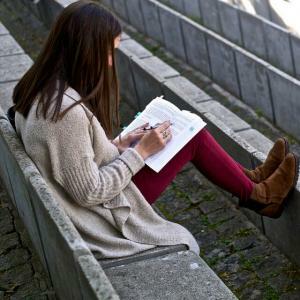 In fact, changing your answer a second time is probably a sign that you need to focus on improving your study strategy. This is the kind of problem that student’s focusing on familiarization instead of memorization have. If you’re regularly changing your answer then this is a blatantly obvious sign something is wrong. Sure… you’re going to change your answers a couple times on every test. 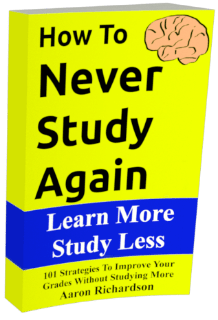 You need to improve your studying. Some of the most common problems are using familiarization based strategies and avoiding test-taking (recall) based strategies. When you’re recognize an answer but can’t quite put your finger on whether or not it’s right, you’ll probably end up changing your answer. Ever change your answer and get it wrong? Ever not change your answer and get it wrong? Ever change your answer from a wrong one to another wrong one? Tell your story in the comments below. Sounds like I need to improve my studying. I’m always struggling to figure out which answers are right. It’s good to know which direction to pick though. I’m willing to bet I can break these odds! haha I’ll still get them wrong.